The storm has 110 mph winds. Forecasters have said that Michael could make landfall in the Florida Panhandle as a Category 3 storm or possibly greater. “On the forecast track, the center of Michael will move across the eastern Gulf of Mexico through tonight. 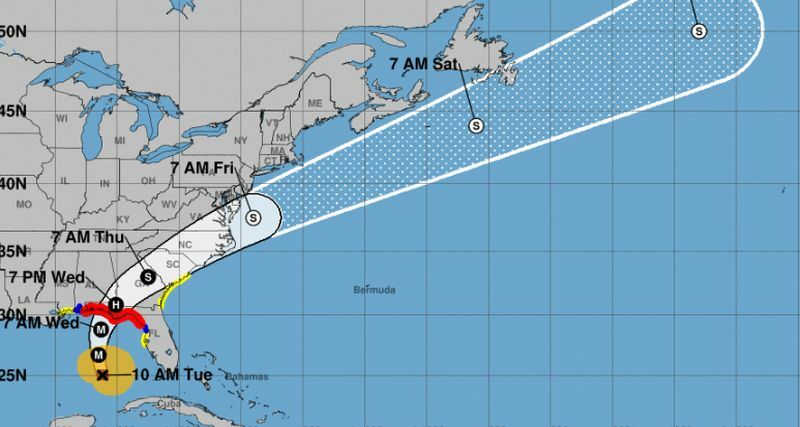 The center of Michael is then expected to move inland over the Florida Panhandle or Florida Big Bend area on Wednesday, and then move northeastward across the southeastern United States Wednesday night and Thursday, and move off the Mid-Atlantic coast away from the United States by Friday,” the NHC said. “Hurricane conditions are expected within the hurricane warning area along the U.S. Gulf Coast by Wednesday, with tropical storm conditions expected by tonight or early Wednesday. Hurricane conditions will also spread well inland across portions of the Florida Panhandle, southeastern Alabama and southwestern Georgia,” the NHC advised. A tropical storm watch is in effect for Chassahowitzka to Anna Maria Island Florida, including Tampa Bay as well as the Mississippi/Alabama border to the Mouth of the Pearl River. A tropical storm watch is also in effect for Fernandina Beach in Florida to South Santee River in South Carolina. “Michael is expected to become a major hurricane later today, and remain a dangerous major hurricane through landfall. Significant weakening should occur as the center moves inland over the southeastern United States, but re-strengthening as an extratropical low is expected when the system moves over the western Atlantic,” reads a discussion of the storm from the NHC. Mandatory evacuations were ordered in areas of Panama City Beach that started on the morning of Oct. 9, ABC News reported.